Marc Lewis is a neuroscientist and professor of developmental psychology. His book Memoirs of an Addicted Brain: A Neuroscientist Examines His Former Life on Drugs, was the first to blend memoir and science in addiction studies. The Biology of Desire is his second book. After reading and finding myself fascinated with the harrowing account of a new mother wrestling with her alcoholic demons in Drunk Mom, I saw that this book was coming out, and felt just in the right mood for it. Now I feel like I could go out and help some addicts find their synaptic pathways back to freedom. But, I’m sure you need a bit more training than reading two books. 1. Contrary to popular belief, addiction is not a disease. This is the premise of Lewis’s book. He believes that treating addiction as a disease is preventing many people from being able to ‘recover’. In his book, Lewis uses the personal stories of 5 different ‘recovered’ addicts, combined with explanations of how the brain works and changes as we learn new things and form new habits, to show us how addiction can happen and also how it can be overcome. Addiction is really just a very serious habit that has formed over time. Brains just do what hundreds of millions of years of evolution have determined to be useful, and that includes identifying things that taste good or feel good to us… Addictions may be the uncanny result of a brain doing exactly what it’s supposed to do. 2. The brain is very cool. Lewis explains not only that it is forever changing and developing depending on our experiences every moment of the day, but also how it does this and what it means for the way we behave. Many of the habits we form over the years even make up what we call our ‘personality’. 3. 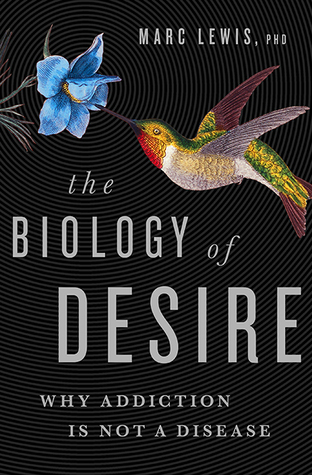 The biology of desire. In order for strong habits to form, we have to feel strong emotions connected to the action. Desire is one of the strongest emotions we have, and is “evolution’s agent for getting us to pursue goals repeatedly”. Desire is the emotion that can get addicts into their mess, and it is also the one that can get them out. … addiction need be no more than a stage in the development of the self… a few former addicts have told me that they wouldn’t be who they are now without the struggles they endured while trying to quit. 5. Studies have shown that people are far more likely to become addicts or to commit suicide if they have had emotional trauma in the past or can see no hope for the future. This doesn’t really come as a surprise, but Lewis takes this and applies it to his own work with addiction; in order to overcome addiction, addicts need to be able to see their lives progressing, “from a meaningful past to a viable future”. I found this book so interesting, but it is not the kind of book you can skim; there’s a lot of brain science going on. A lot of it gets repeated several times, in different ways, so that by the end of the book I felt I had it figured out. I could almost feel the pathways in my brain changing and growing as I was reading this book. The Biology of Desire also made me see some of my own habits in a different way; a couple of them bordering on compulsive, which he talks about as being the final stage of becoming an addict – not being able to control your impulses. Luckily, my habits/addictions are pretty tame. For example, I have always indulged in a night-time snack while reading my book after all my kids are in bed. This has been going on since they were born (my oldest is 14 now). No matter how many times I tell myself there is no need for me to continue with this habit any more, when the time comes I just can’t seem to get my mind off it until I find myself a snack. It really has become ingrained in me after all this time. Now I know that my desire to stop must not yet be greater than my desire for that snack. I don’t think there’s anything wrong with your little snack at night. You can free yourself by just giving yourself permission to have it! This book sounds really interesting. I can relate to that! I don’t have a regular snacking schedule and often I don’t snack, but I DO have a problem with stopping eating things once I’ve started on them. Yeah, I need to learn to control it to just a few bites or a few chips. I have a sugar habit. I would, in theory, like to quit sugar, but in practice, I really have no desire to stop eating sugar. It tastes too good! Funny you say that 🙂 I usually take at least 30 minutes to read before I go to bed. Last night I was craving a piece of chocolate while reading and got up and got a piece. It probably did not help that I was reading a mystery that had cooking and eating throughout the chapters I read (i.e. chocolate strawberry pie, pimento cheese dip, greek salad, etc.). I have a habit that really throws me off and hope I am not alone. I learned from a young age that you go up stairs on the right and come down on the left – same as walking on the sidewalk. I have some encounters lately that have just thrown me off and these people do not move to their side so I end up moving to go around them. Is this weird or not?!? I had trouble figuring out what side of a staircase to walk on in India. Got into a bit of a stalemate with an old woman for a moment. Yes, it is – I think you would find it interesting to read in addition to the others you’ve been reading. The book sounds very interesting, especially given your comments about the way it has made you see your own habits in a different light. I first came across this idea in Norman Doidge’s book, The Brain that Changes Itself, and I would definitely like to add Mark Lewis’ to my TBR (as well as Doidge’s new book, which sounded just fascinating in a recent episode of “The Next Chapter” on CBC). The idea of being “free” rather than in “recovery” rings true for me. I’ve been working hard at changing some habits in my life this year, some bookish ones included (including my insistance upon reading scores and scores of library books while my own books go unread, which is certainly a privileged “problem” to have, and it might not even be a “problem” were it not for the matters of volume and scale!). It feels like a long and demanding process, even with relatively simple patterns, but I do get ridiculously pleased when I see a pattern of change that makes me smile about the possibilities ahead, and then I believe that I can make more substantial changes too. And when books are a big part of your life, making a change on that front is big news, right? He mentions Doidge in the book as being one of the authors to bring the term “neuroplasticity” into the spotlight. His new book sounds good, doesn’t it? Another interesting sounding book Lewis mentions on the same topic is The Woman Who Changed Her Brain by Barbara Arrowsmith. It’s about the cognitive exercises she devised for herself in order to overcome her severe learning disabilities. Very cool. I have that same library “problem” as you. Every time my hold list gets low, I tell myself I’m not going to add any new ones until I read some of my own books, but I can never do it. Sigh… It is exciting when you can finally make some headway! This one is going on my list to read. Thanks!! I was interested in this book; it looks really interesting! I may have to go pick it up now! Oh, this sounds SUPER interesting. I wonder if this book is causing a bit of controversy, since the idea of addiction as a disease/disorder is once that seems so widely accepted. Definitely want to check this out. I get more the feeling that this idea is kind of on the outskirts, but making its way in. At the end, he describes a new project in the works based on this theory. I’ll be curious to hear how it works out! Also, he talks about the good things that have come from describing addiction as a disease, like more funding for recovery programs and research, as well as helping to reduce the stigma attached to addiction. But, then he goes on to explain the limitations of it. I liked that he didn’t rail against the theories he disagreed with – his scientific explanations made it all pretty clear on their own (I thought so, anyway). Yes, echoing Shannon’s thoughts here! I feel like I’ve recommended this book to everyone and their mother, so apologies if I’ve already rec’d it or you’e already read it, but Chasing the Scream by Johann Hari does a great job explaining the mechanisms behind addiction and how recovery isn’t as simple as “take away the drug, go through withdrawal, be free.” The book covers more (history of the war on drugs, etc. ), but I think you might especially enjoy those chapters! An excellent movie, and one of the best on the subject of alcoholism, is The Lost Weekend. Hi Naomi! I’m hoping to finally catch up! This sounds like a fascinating book. I’ve been thinking about this a lot, parenting my 11 year old, who to me seems easily “addicted” to things like sweets, crunchy snacks, video games, etc. I find it interesting that this book says addictions are natural behaviors. It’s a fine line, I wonder, between addiction and passion? Because I wonder about my husband’s “addiction” to his work, or my son’s “addiction” to Minecraft, two things that give them their creative outlets and a feeling of satisfaction and challenge. It is this addiction (or “desire”) that can lead people to excel at things they love too, I wonder. So funny you mention snacking! Just last night I gave in to my one “sin,” which is chips and wine late at night. Every once in a while I’ll do that – pair up Doritos (or chips and salsa) with a glass of wine, and I never feel great once I am done. It definitely works in good ways, too, I think. If you get a lot of pleasure in your work, it could lead to you working more, which could lead to promotions, discoveries, etc. Same idea, I think, just extreme and unwanted in the case of addiction to drugs/alcohol/food/gambling. I was just talking about this subject with friends earlier this week; this sounds a little bit like a book I cannot for the life of me remember the name of (which I also want to read) that I think argues, like this book, that addiction is not exactly a disease, but (maybe not like this book) very much tied to environmental factors. Gah. I wish I could remember the name of the book or the author. But now I want to read this one too! Thanks! You could definitely read it by then – it’s not too long. And, you might be able to bring an interesting perspective to the table! If you end up reading it, let me know if it influences the way you see addiction!